Enjoying a hot shower whenever you feel like it is one of life’s simple pleasures. 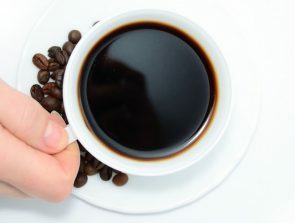 It comes at a high cost though – having hot water at the ready means it’s constantly being heated and reheated which leads to needless energy consumption and sky-high power bills. If your old water heater is due for a replacement, getting a smart one is the best way of saving energy while not giving up on that relaxing shower. And if it’s working fine, you can still get all the benefits of a smart water heater by upgrading your traditional model with a smart controller. Smart water heaters and controllers establish a wireless connection to your phone or computer. From there, you can monitor the heater’s status, set schedules, and precisely adjust the output temperature. If there’s ever a leak or malfunction, sophisticated sensors can alert both you and a licensed technician in time to prevent the worst. Best of all, this works no matter where you are. Here are the best smart water heaters and water heater controllers on the market. Whether you need a water heater that can satisfy the needs of a family of five or a controller that will give you peace of mind on an upcoming trip, there’s a model among them that will enrich both your smart home experience and your wallet. Easy to install, responsive app, and affordable. It saves energy by determining usage patterns. 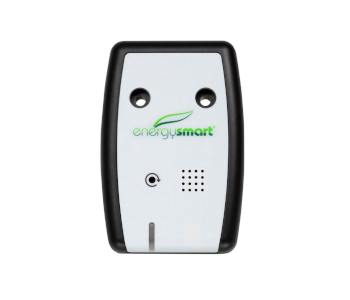 Energy-efficient and has a comprehensive app. Water heaters are the 2nd most power-hungry appliance in your home, right after HVAC systems. 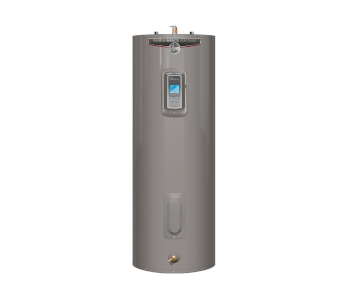 Balancing the hot water demands of a busy household and high power bills is a challenge that will come easier if you invest into Rheem’s 50-gallon Performance Platinum water heater. It takes advantage of quality materials and a sleek touchscreen interface to save big in the long run and it also comes with a smartphone app that gives you complete control over it wherever you are. You probably wouldn’t associate the word beautiful with a water heater, but that’s just what the Performance Platinum is! 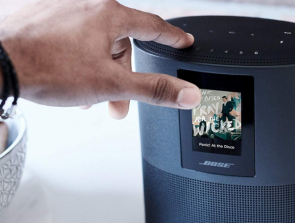 Its modern metal-gray exterior is enhanced by a colorful touchscreen interface which lets you precisely set the water’s temperature in 1-degree increments. The water heater is exceptionally quiet too as its pump turns on sporadically and produces noise that’s barely louder than a whisper. During times of low water consumption, the heater operates by taking in the surrounding air and using its heat to elevate the water temperature. This process is much more energy efficient than using only the electric heating element. When hot water demand grows, the element turns on to provide the necessary warm water output quickly. At 50 gallons, the water heater has enough capacity to meet all the demands of a 5-person household. You can also save more energy while no one’s home for a while by using Vacation mode. This instructs the water heater to heat only enough water so that the pipes don’t freeze. The water heater has built-in Wi-Fi. To use its smart features, you have to install the EcoNet app and put in your Wi-Fi credentials. The app lets you set the temperature remotely and can send text or email notifications in the event of a water leak or maintenance issue. It also displays safety & maintenance tips you can use to keep your water heater running smoothly. Unlike traditional water heaters, this one has a side inlet & outlet for safety reasons. This makes DIY installation harder. It takes longer to heat the water when not a lot of it is consumed since the electric heating element won’t be used. A new smart water heater will lower your power bills, but what if you don’t want to make that considerable investment or have a water heater which still works well? Aquanta is an energy-saving gadget that has a lot in common with the Nest Learning Thermostat. It tracks your household’s hot water needs and usage patterns over time and designs a schedule that lets everyone enjoy a hot shower while bringing needless power consumption down considerably. Aquanta is made up of two parts – a sensor which slides into the water heater through the T&P valve, and a small blue control unit which stands on top of the heater. The installation is a relatively simple DIY job which requires some electrical and plumbing knowledge. It involves replacing the T&P valve and connecting the power main to the control unit. Experienced DIY-ers should be able to complete the installation in 20 minutes. The sensor measures enthalpy i.e. the amount of energy used to maintain water temperature, and the quantity of cold water that’s being pumped in as hot water is used. 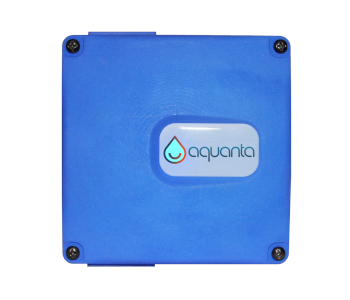 This lets Aquanta determine how much water is needed and when. Once a pattern has been established, Aquanta will turn the water heater off during times of infrequent use to save energy. It also has overheating detection as an additional safety precaution. You control Aquanta via a web app either from your smartphone or computer. The web app has an intuitive interface through which you can activate or disable Aquanta’s intelligent mode, create manual schedules, or set up leak alerts. Aquanta even works with Nest! When paired with a Nest thermostat, it will automatically shut off your water heater once Away mode is engaged. Aquanta is only compatible with electric storage-style water heaters. 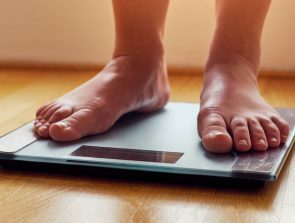 While these are present in the vast majority of American households, owners of hybrid, tankless, combo, and boiler-fed water heaters aren’t able to take advantage of it. There’s no mobile app which some users might find off-putting. 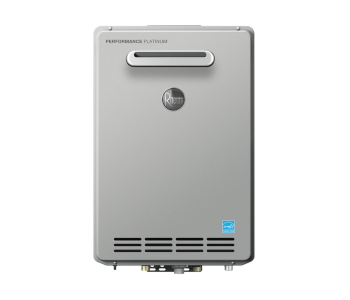 Rheem’s Performance Platinum line is made up of water heaters designed to provide maximum comfort and energy efficiency without compromising on output. The tankless water heater that’s part of it comes with the same EcoNet smart experience as our overall winner, features a power-saving setting, and supplies hot water within seconds without wasting power on heating an entire tank. Everything about this water is engineered to make it as efficient as possible, starting with its installation. This model takes up less space than a traditional heater and offers even more installation options thanks to improved vent placement. Rheem’s gas-powered water heaters come with condensing technology which captures the heat from exhaust fumes and uses it to help raise the water temperature making the process more energy-efficient. Owners of large homes are reserved towards tankless water heaters as these can often not meet their needs. The Performance Platinum model has an output of 9.5 gallons per minute which is enough to simultaneously supply three bathrooms with hot water. You could be showering, running the dishwasher, and running a bath and still have enough hot water left for the needs of others. The heater is designed to work in all climates, so even if you’re living in the continental US its output will not suffer. Efficiency is further enhanced by the EcoNet app. Its version for tankless models allows you to turn the heater on and off, set the outgoing temperature, and receive alerts on leaks or other problems. The app will walk you through troubleshooting steps you can attempt on your own and suggest the nearest professional services to resolve more serious issues. This model doesn’t come with recirculation, meaning that you’ll need to purchase a kit separately if you don’t want to let out cold water from the pipes first each time you use a far-away faucet. You have to connect two pipes with a plastic clip during installation. This clip is flimsy and sometimes even missing altogether. Without it, the water heater will leak. Tankless water heaters deliver hot water on demand and take up next to no space. 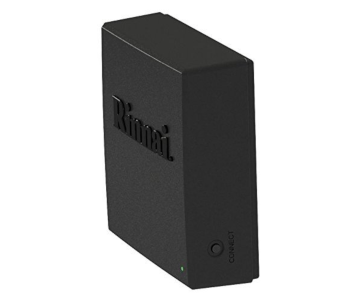 If you have one made by Rinnai, you can smarten it up with the Control-R, a small unit which lets you control the heater remotely or through voice commands using Amazon Alexa. This controller attaches easily to any gas-powered Rinnai tankless water heater manufactured within the last 10 years. It connects through two wires and is ready to start controlling the water heater in minutes. You can pair the Control-R with Rinnai’s push button and remote sensors to enable automatic recirculation of water once someone enters a room where hot water is needed instantly. Rinnai’s app has a minimalistic design and clean interface made up of four icons with additional ones popping up in case there’s an alert. Tapping on the “Priority” icon brings you to a screen where the heater’s temperature and scheduling options can be adjusted. “Usage” offers an in-depth overview of stats such as the current water flow, inlet & outlet water temperatures, how long the system has been in operation etc. “Monitoring” displays maintenance tips and error logs. In this tab, you can also set up remote monitoring through a licensed dealer. When an error occurs, the code is immediately sent to the dealer’s version of the app along with pertinent statistical data which helps diagnose and address the problem quicker. This is the only smart water heater controller which supports Alexa. Voice activation works well for the most part, but you’ll need to mispronounce Rinnai as “reen-eye” for it to work. Even then, commands are executed after 10-20 seconds, so you might be better off using the app instead. App compatibility is by far the biggest issue with the Control-R. The Android version wouldn’t even start on most phones while its iOS equivalent would time out during certain actions. Rinnai’s subsequent patches have largely fixed this, but the apps are still unstable and buggy. 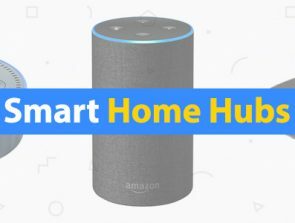 Lowe’s is a large retailer that has, like Amazon, made a foray into the home automation niche. The EnergySmart water heater controller is a device which automates the operation of EnergySmart water heater models. It is under the umbrella of Iris, the proprietary Lowe’s smart home hub. If you own a compatible model, this inexpensive add-on is a great investment. You don’t need Iris to use the controller since it connects to your home Wi-Fi network and has a webpage interface much like Aquanta. This interface is limited to turning the device on or off and adjusting the temperature. Once paired with Iris however, you can use the Iris app for more in-depth control. Adding the water heater controller to the list of known Iris devices involves entering a code printed on its side and waiting a few minutes for it to be registered. The controller can then be accessed through the app, which enables scheduling and water alerts. Scheduling is particularly useful as it lets you specify the running times and water temperatures for an entire week. Iris also displays the estimated hot water level and can notify you if it drops below a set point. This controller makes use of the onboard interface of specific EnergySmart water heaters and isn’t compatible with competing models. The water heaters it does support are few, available only at Lowe’s, and are more expensive than similar models. If you’re already satisfied with your Rheem electric or gas-powered water heater, there’s no need to go all in and buy a smart model. Rheem offers a convenient and affordable upgrade to select “dumb” models through the Home Comfort Module. 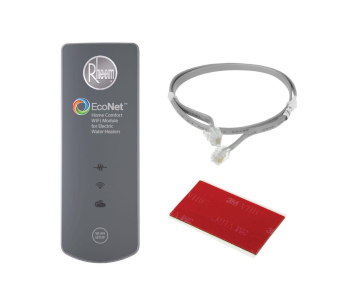 This Wi-Fi controller unlocks the ability to control your water heater remotely through the EcoNet app. Home Comfort is an unobtrusive gray gadget which connects to your water heater through a specialized cable. The cable attaches to the water heater’s control panel, drawing power from and relaying instructions to it at the same time. Two wires need to be connected, so don’t attempt the install if you have no electrical knowledge. Otherwise, setup is done in minutes. The EcoNet app is now in its 3rd iteration and has an improved layout that’s easy to navigate. Temperature adjustment, troubleshooting, and alert settings are clearly labeled and easy to customize. Vacation mode can be turned on remotely from it and its duration can be set too. Home Comfort comes with a leak sensor which sets off an alarm once water is detected. This will send a push notification, email, or text to your phone, informing you of what happened and providing a standardized error code that will help technicians locate and service the problem faster. Rheem’s app would greatly benefit from a scheduling tool. Day-to-day heating times can’t be set – your only options are to manually turn the water heater on or off. The module isn’t prone to disconnects, but if one does happen, you need to reinsert the connection cable to reestablish the link. This isn’t a problem if you’re home, but if it happens during vacation you won’t be able to check up on the water heater and react to leaks in time.